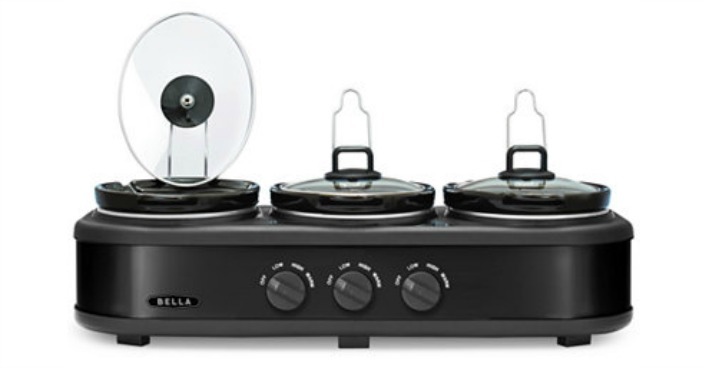 Bella Triple Slow Cooker Just $19.99! Down From $60! You are here: Home / Great Deals / Bella Triple Slow Cooker Just $19.99! Down From $60! Macy’s has this Bella Triple Slow Cooker on sale for $19.99 (Reg. $60)! Plus shipping is FREE on orders over $50 or with any Beauty purchase and you may be able to get FREE in-store pickup! A must-have for frequent hosts or anyone juggling several dishes for dinner, this triple slow cooker from Bella features individual controls for each pot. Spoon rests complete the package that’s perfect for parties or family buffets.